Chinese fishing fleets, driven by plummeting catches close to home, are flocking to distant West African waters, where they engage in ecologically ruinous bottom trawling, subterfuge and other illegal activities that threaten marine resources in a region already under pressure from overfishing, according to a report issued on Wednesday by Greenpeace. The study, the result of a two-year investigation, accuses hundreds of Chinese-owned or Chinese-flagged vessels of taking advantage of weak enforcement by African governments to indiscriminately net untold tons of fish off the coasts of Gambia, Guinea, Guinea-Bissau, Mauritania, Senegal and Sierra Leone. Among the worst offenders, Greenpeace said, is the state-owned China National Fisheries Corporation, whose ship operators were said to have lied about their locations, underreported the amount of fish in their holds and used damaging fishing methods that are largely banned in Chinese waters. The report said that government regulators in Beijing had been lax in enforcing regulations that govern overseas fishing. Investigators documented 74 of 92 fishing boats that had turned off the tracking devices mandated by international maritime law; others had been manipulated to give out incorrect locations, including five ships that claimed to be operating in Mexican waters. China is under-reporting its overseas fishing catch by more than an order of magnitude, according to a study1 published on 23 March. The problem is particularly acute in the rich fisheries of West Africa, where a lack of transparency in reporting is threatening efforts to evaluate the ecological health of the waters. Fisheries experts have long suspected that the catches reported by China to the Food and Agriculture Organization of the United Nations (FAO) in Rome are too low. 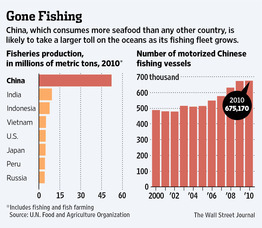 From 2000 to 2011, the country reported an average overseas catch of 368,000 tonnes a year. 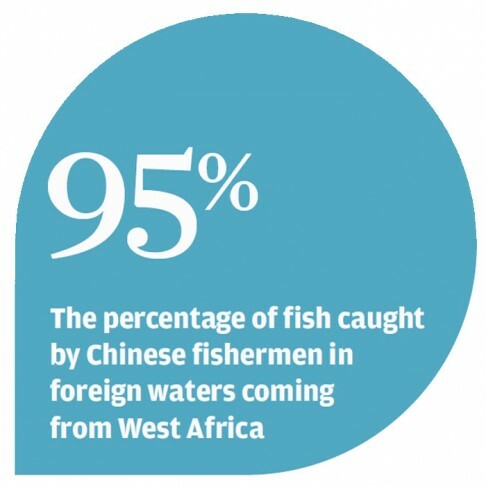 Yet China claims to have the world’s biggest distant-water fishing fleet, implying a much larger haul, says the study, which was funded by the European Union (EU). The team of investigators estimate that the average catch for 2000–11 was in fact 4.6 million tonnes a year, more than 12 times the reported figure (see ‘A colossal catch’). Of that total, 2.9 million tonnes a year came from West Africa, one of the world’s most productive fishing grounds. These ships and companies contribute to local employment, increase tax revenue and contribute to the local economy, and are thus welcomed by local governments and people. Year after year, Mauritanian populations of bottom-dwelling species such as octopus, grouper and sea bream have remained stubbornly low — a sign of over­fishing by bottom-scraping trawlers, he says. Fishing contracts between Chinese companies and African nations are secret, so to estimate the catch, the team had to do some sleuthing. The picture was further clouded because Chinese companies sometimes operate vessels flying local flags. So at least ten researchers combined clues from field interviews, scholarly articles and newspaper and online reports in 14 languages to estimate how many Chinese fishing vessels were operating in 93 countries and territories. They found many in nations where China reported no catch. The estimates were averaged to reach their conclusion: China had at least 900 ocean-going vessels, with 345 in West Africa, including 256 bottom-trawlers. The scientists estimated the catch per country on the basis of an assumed average catch for each type of vessel. “These numbers may not be absolutely exact, but they give the first hint of the magnitude of the problem,” says Boris Worm, a marine ecologist at Dalhousie University in Halifax, Canada, who was not involved in the study. If the new numbers stand up, renewals of fishing contracts with West African nations could be affected. In the 2000s, under public pressure, EU fleets stopped fishing in coastal waters off much of West Africa, except Mauritania and Morocco. They were replaced by Chinese vessels, mostly large bottom-trawlers whose violations of near-shore no-fishing zones have led to protests. Apparently numbers of octopus and shrimp available to be taken in EU contracts with Mauritania, primarily by Spanish vessels, were already small. But China’s under-reporting of the distant-water catch is the more important problem. 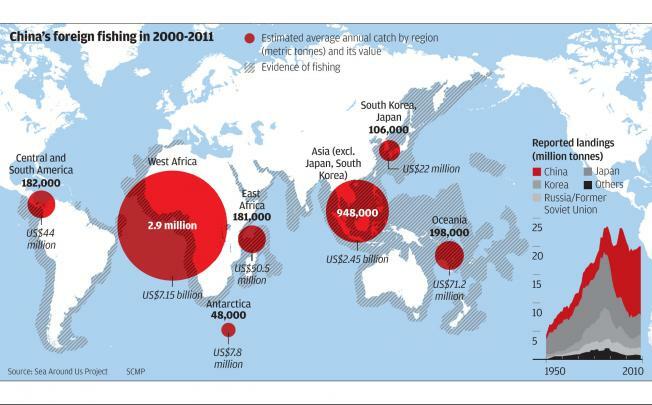 It shows the extent of the looting of Africa, where so many people depend on seafood for basic protein. who are the biggest losers in this exploitative relationship. Among the biggest losers, Greenpeace said, were local African fisherman, who complain of diminishing catches and increased costs. “They are forced to travel further to catch fish and often have to compete for space with industrial trawlers in dangerous waters, increasing the risk of deaths at sea,” the report said.